Oleg Lyashko reported secretly going to the Lugansk region on Sunday night and detaining Arsen Klinchev, a member of the local parliament from the Party of Regions. "The scum Klinchev will answer for his crimes. We detained him and handed him over to law enforcement. I am sincerely grateful to everyone, who helped with this deed. The video is coming shortly. The fight goes on," Lyashko wrote on his Facebook page. The promised footage followed soon. In it Lyashko is seen entering the office, as Klinchev later clarified, of local General Vladimir Guslavsky with a group of half a dozen men, whose faces are covered with a black circle. They floor the MP and handcuff his arms behind his back. Then Lyashko is seen calling Klinchev “scum” several times, while forcing him to make a statement on camera, ordering his supporters to vacate the regional administration building. The building was captured on Sunday by a group of protesters, who opposed Mikhail Bolotskih, the new Kiev-appointed governor. 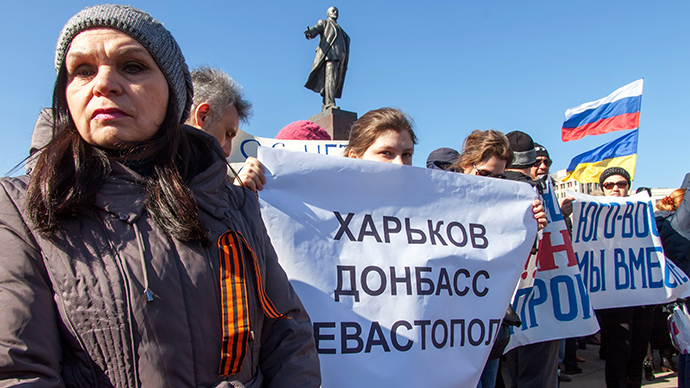 The protesters forced Bolotskih to sign his resignation, but hours later he stated that the resignation was invalid because it was signed “under threats.” The protesters also raised the Russian flag in front of the administration. 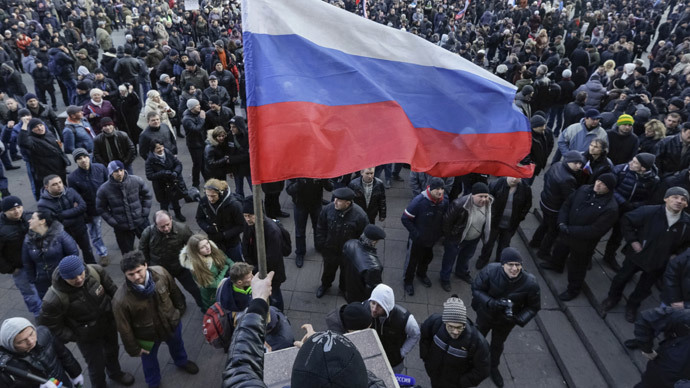 Lyashko forced Klinchev to call on the protesters to take down the Russian flag and free the administration building, while the MP was denying any authority over the people. “You're scum, that's what I say. 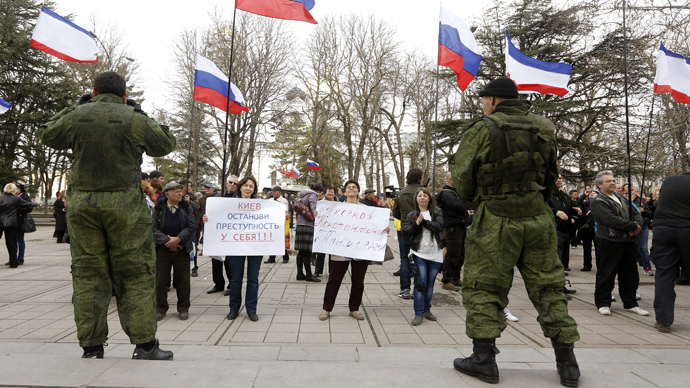 Now tell your people to go out of the Lugansk administration. And make a good face now, nobody will give you money, retard,” Lyashko told the MP. Klinchev, still handcuffed, is then dragged into a bus, where one of the men who abducted him lectures him on his pro-Russian stance. He promises to hang him “by the balls” and “call an army to f**k you”. After driving for nearly 30 minutes, a phone rang and a voice, (Klinchev assumed it was Lyashko’s), ordered their return. Back in General Guslavsky’s office, Lyashko continued his intimidation, after which he and his group left. Shortly after being released, Klinchev shed light on the conflict and gave his version of what happened. Speaking to the media, Klinchev said that he met with General Guslavsky, as they agreed, after midnight. “At 11pm, all people know, General of Lugansk [regional] Department of Internal Affairs was there. He was talking to the people and was persuading them to leave this [administration] building and was in general listening to what people wanted. After that he addressed me and said: Arsen, after you talk to people, come to my office and we will discuss everything,” Klinchev said. Klinchev then goes on to say that at around 12am he called General Guslavsky, who asked to come up to his office to talk. “Once I entered his office and took a seat, Lyashko along with another, about eight people, run into the room. In fact, many of them I personally know. There were also journalists, particularly, from the Ukraine TV channel. Those people were standing aside, while a group of four people started twisting [my arms]. They handcuffed me,” Klinchev said. After that Klinchev was taken from the building through a back door and put on the ground. “Actually, all of them [eight people] were not wearing masks. Honestly, I already said good bye to my life, because those people who I saw just would not leave me alive afterwards. While we were driving they were telling me what awaits me, that I am a scum and a scoundrel and etc,” Klinchev continued. “After we came back and went up to Guslavsky’s office, the sitting governor [Bolotskih] was already there. After that Lyashko and his team left. Actually, I am now being told that Lyashko now says that he is boss here in the Lugansk region and starting this moment, everyone who does not agree with him will be ‘driven in a trunk’,” Klinchev said, adding that according to the governor, he was supposed to be sent to Kiev on a charter flight. Lyashko, who is the presidential candidate for his own Radical Party, has a shady past not normally expected from a person with ambitions to head a nation. In 1994, he was convicted of large-scale embezzlement and abuse of power and sentenced to six years, but was amnestied a year later. His criminal record was expunged in 1998, so now, in this regard, Lyashko is on par with the ousted Ukrainian President Viktor Yanukovich, who has two expunged convictions dating back to the Soviet era.